Tasty Creations offers a full array of options for all your catering needs. We have many years of experience in working with social events, corporate events, and weddings. Additionally, we have started catering for student school lunch meal programs and private jets. For any occasion, we are flexible to design a menu that fits your needs. 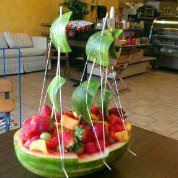 From a delivery, to buffet service, or even servers, Tasty Creations is prepared to make any event memorable.